The Temperance card signifies good management, successful partnerships and good health and quick recovery from illnesses. 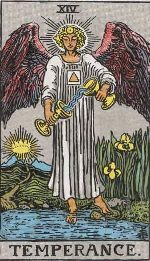 In some cases, the Temperance Card represents a happy outcome to a difficult situation. The Art card, also known as Temperance card, shows the picture of a young woman who appears angelic. The woman is transferring water from one vessel into another. She is so careful in her work that not a single drop of water falls down in the process of pouring the water. This is art, which requires lot of hard work, dedication and perseverance in order to attain perfection. The pouring of water may also indicate the flow of life force. We often squander the god-gifted energy in course of our daily life by going against the laws of nature. For example, we should not stand still but keep moving like water in the river. If we stand at one place, we will become stagnant and start stinking.